Allergies and chronic sinus problems can lead to frequent use of antibiotics, chronic headaches, nasal stuffiness and drainage.Usually a CT scan is needed to assess the drainage of the sinuses. Sometimes medical therapy such as nasal sprays and steroids can help resolve the problem. Other times surgery may be needed. In mild and moderate cases we prefer using the balloon system to restore sinus drainage. 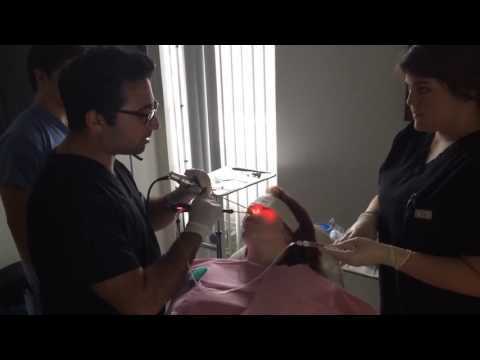 Dr. Masoud Saman offers the most cutting edge technology and highly advanced techniques to perform the most optimal sinus procedures for patients in all regions of DFW area including Plano, Frisco, Dallas, Richardson, McKinney, Allen, and more. To learn more, contact our Plano, TX office to schedule your consultation today. Endoscopic sinus surgery is a fairly short surgery, usually taking under an hour. It may be performed under general anesthesia. Dr. Saman will use an endoscope that is entered through the nose and the surgical instruments will then be utilized. There are no incisions on the face. Then Dr. Saman will address the structural issues within the sinuses that are the cause of your problem. Polyps may also be extracted and in some instances, laser technology is used to shrink swollen nasal tissues. You may feel a little sore after the surgery, but most patients can return home the same day. We will be sure you have all the products, like a nasal spray and a prescription antibiotic, to heal successfully and comfortably at home. Patients should avoid blowing their nose or participating in strenuous exercise for a few days following the procedure. A follow-up appointment with Dr. Saman will need to be scheduled so that he can document your progress, clear out any crusting inside the nose, and adjust your treatment plan as needed. As an alternative to more invasive, traditional sinus surgery, an endoscopic sinus procedure can effective results with no major downtime. At Saman ENT & Facial Plastic Surgery, Dr. Saman performs endoscopic sinus surgery as a way to provide treatment for chronic sinusitis. Contact our Plano, TX office today to schedule your consultation to learn more about this advanced procedure.